For the first time in its six-year history, Caffeine & Carburetors will draw car enthusiasts to New Canaan's Waveny Park this weekend. The event will take place at the park from 8 to 11:30 a.m. Sunday. Despite some opposition by several Park and Recreation Commission members, organizers won support from town officials last month to move the gathering to Waveny for a one-time trial. 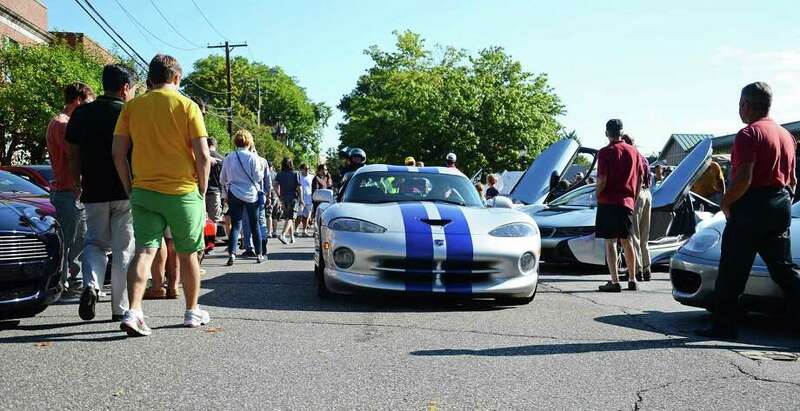 Caffeine & Carburetors, which used to be a small car show in downtown New Canaan, has grown so popular -- drawing hundreds of cars and thousands of people -- that the town is no longer able to provide each of the planned shows with adequate police. The event once attracted only about 30 drivers outside Zumbach's Gourmet Coffee, 77 Pine St., on a Sunday morning for some caffeine and car talk. Doug Zumbach, the event's founder and owner of the eponymous coffee shop, as well as police officials, say it will be easier to control traffic at the park. "We're very excited that we have all the necessary approvals," he said. "We're grateful to the town for allowing us to utilize this wonderful facility." Recreation Director Stephen Benko said he's not sure how many people will turn out, especially because the event does not require pre-registration, but he's hoping event-goers will be pleased with the new setting. "It's a first-time deal. ... I don't know what to expect," he said. "One thing is that you're probably not going to get the number of spectators you got in the center of town." Benko noted that many people would go downtown for breakfast or errands and run into the show. "But I'm not anticipating any issues," he said. "I hope it's a nice sunny day (and) we'll have a nice turnout." As of Tuesday, the weather during Caffeine & Carburetors is forecast to be mostly sunny, with temperatures in the low 60s. Zumbach, whose shop will be selling coffee at a stand in the park, said there will be some surprises at the event "and some really nice cars" coming. "I just think it's going to be a really nice show," he said. Besides police officers, the New Canaan Community Emergency Response Team and other volunteers also will provide help at the event. Benko said volunteers will be directing traffic, but he's expecing show vehicles to drive up to Waveny's lots, while spectators may be asked to park at the Waveny pool parking lot, by Lapham Community Center, or even at the adjacent New Canaan High School lot. As they did at the latest gathering Sept. 7, organizers will be collecting donations for the New Canaan Food Pantry. During the show, the Carriage Barn Arts Center will host a children's art workshop, featuring fun car-themed crafts and refreshments. Starting next year, Zumbach is hoping to have two gatherings downtown and two elsewhere -- possibly Waveny Park, if this Sunday's trial proves a success.